If you purchase a Windows 7 PC between June of this year and February 28th of next year, Microsoft has a pretty sweet deal for you. They are going to let you purchase a Windows 8 upgrade for just $14.99. Microsoft announced the special deal a few months back, but the Windows 8 upgrade registration page just went live in the last 24 hours. It’s an unheard of move for Microsoft, who in the past, asked that you cough up at least $99 to have the privilege of using its latest operating system. With Apple gaining so much traction is the personal computing world and offering its latest operating system upgrades for a minimal fee, it’s easy to see why Microsoft is changing tact. Between this Windows 8 upgrade offer and the rumored $199 price point of the company’s Surface tablet, Microsoft are well-positioned to combat the iPad-dominated tablet market. 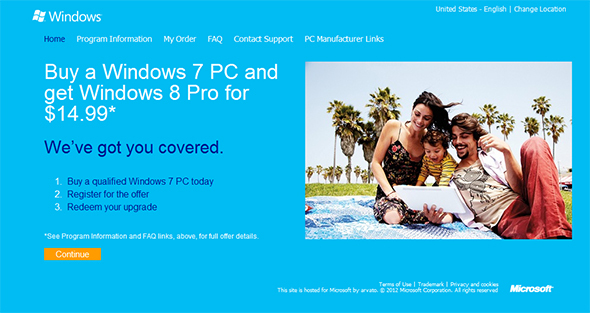 Once you register, you’ll get an email once Windows 8 hits retailers with more details. The official release date is October 26th. More details on the deal straight from Microsoft below. The promotional price is limited to one upgrade offer per qualified PC purchased, and a maximum limit of five upgrade offers per customer.